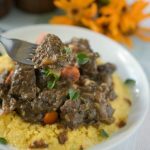 Italian Venison Stew with Polenta is a typical recipe from Friuli, a Northern region in Italy. The venison first marinates in a red wine marinade, then it simmers with porcini mushrooms and bacon. 3 pound venison roast trimmed of all fat and the silverskin in the meat. Cut into 1 1/2 inch chunks. 1/2 cup dried porcini mushrooms 14grams reconstituted in 1 cup warm beef broth. Trim and cut the venison roast into the 1 1/2 in chunks. Put the meat in a gallon zip-lock bag. In a large measuring cup make the marinade by mixing the 2 cups red wine, minced garlic, and pepper together. Pour over the meat and seal the bag. Put the bag in a bowl, in case it leaks, and refrigerate at least 24 hours. Drain the meat and keep the marinade. In a heavy cast iron pot, heat 2 Tablespoons of olive oil and bacon drippings over high heat. Add the venison and sear on all sides until the chunks start to brown. You may have to do this in batches. Don't overcrowd the meat or it won't brown. Remove the meat and set aside. Add the 2 Tablespoons butter to the pot and reduce the heat. Add onions, carrots, fennel, red pepper flakes, salt, pepper to the butter. Mix together and cook for 10 to 15 minutes, stirring occasionally. Add the garlic and porcini mushrooms, cook 1 minute more. Deglaze the pan by adding the rest of the red wine, broth, porcini broth. Stir the bottom of the pot to make sure you get all of the yummy bits stuck to the bottom. Add the Italian seasoning. Return the meat to the pot and turn up the temperature until the liquid reaches a boil. Stir. Reduce the heat to low and cover the pot. Stir periodically. Cook for at least 2 hours and even longer. Longer cooking and lower temperatures will guarantee a tender and flavorful venison stew. When finished sprinkle with chopped flat-leaf parsley and serve over polenta. You can also use beef instead of venison. Use 2 1/2 pounds chuck beef cut into 1 1/2 inch cubes.